If you have a third party SSD you probably noticed that Mac OS X Lion probably doesn’t support TRIM on the drive. While OS X Lion supports TRIM for all Apple SSD’s, many third party SSD’s are left without trim in OS X 10.7, OS X 10.8, OS X 10.9, and OS X 10.10. Fortunately with a free tool called TRIM Enabler, TRIM support can be added to all SSD’s running Mac OS X 10.7.2 and 10.6.8 or later. The newest version of the utility works by patching a kernel extension, and also includes some SMART data to check the health of the SSD drive. Enabling TRIM on a third party SSD is made very easy with this utility, launch the app and flick the switch to “ON” and enter your administrator password to patch the SSD driver to include support for TRIM. Disabling TRIM is just a matter of flicking the switch off. Note: Remembering that this is unsupported by Apple, it’d be wise to backup your Mac drive before proceeding (do a quick manual backup with Time Machine) to protect yourself in the event something goes wrong. 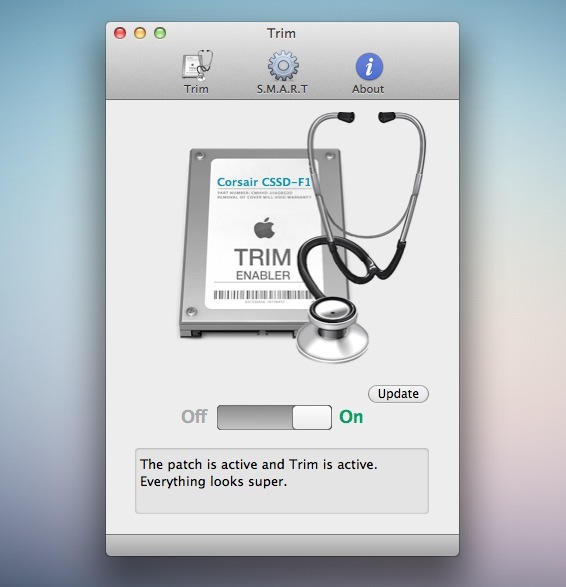 We’ve discussed TRIM Enabler before for OS X 10.6.7, but now that it has been updated to support OS X 10.6.8 and OS X 10.7.2 it’s well worth mentioning again, particularly if you don’t have a Lion supported Apple SSD. Do you use TRIM Enabler with Lion, Mountain Lion, Mavericks? How does it work for you? Let us know in the comments. I’ve been using this since it first came out and haven’t had any problems. It truly baffles me that Apple doesn’t support TRIM natively. This applies to all Sandforce drives which have their own Garbage Collection firmware – enabling TRIM will cause slow-downs rather than improvements. I used the guide you linked to a while back, I don’t see how copying and pasting 4 commands is not for the faint of heart but whatever. Referring to Richard’s comment, I have MBP 15″ with a 240GB SATA3 OWC SSD and I’ve enabled TRIM. Soon after enabling it, I got every few minutes a Spinning Beach Ball of Death that lasted up to 1 minute! After a day I removed the patch and… no more SBBD! So in my case the patch has and adverse result. The OWC disk has a superbe garbage collector: after 2 months of daily usage (more than 10 hours/day), the performance of the SSD did not changed at all! I don’t think I need the TRIM support! this tool slows down 2 of my Macs with SSD and 2 Hackintosh’s … I will never use it again !!! TRIM on non-Apple SSDs conflicts with FileVault2. If you enable both, your drive will be corrupted. I believe Apple did not enable TRIM on other drives for a reason. So I would not recommend this. At least, watch your disk for corruption. Can you restore from a back up of the next and then use the newer tool? Just did this every thing seems fine. By chance I just restored my SSD from backup. It’s an Intel X-25M G2. No doubt thanks to TRIM enabler, my speeds doubled (back to factory speeds I guess)! XBench index as of last year:102. After the restore with TRIM enabled: 270! So yeah – do it! The performance penalties for not having TRIM enabled are severe. would TRIM enabler work on 2 ssds, raid 0 in a mac pro 2009? It depends if it is a software RAID or hardware RAID. If it is software, then yes. If you are using a hardware RAID controller, then that controller’s firmware needs to support TRIM, and there would be no need to tweak anything in Mac OS. TRIMEnabler seems to work well for Mountain Lion 10.8. Does it matter when I enable TRIM? I mean, I installed the OS several days ago and I did already delete some data. I’m enabling TRIM now, do I have to reinstall or just install and TRIM will take care of the already deleted items? It doesn’t matter when you enable it, you will get the full benefit anytime. Without TRIM enabled, the files are delete immediately, but the OS has to wait while the erase operation completes. Once TRIM is enabled, the SSD manages the reuse of blocks internally and the OS is free to move onto the next operation. The data may not actually get deleted with TRIM. Avoiding these extra read/write cycles is what increases performance and the life of the drive. The SSD just remembers that the block is ready for reuse, and when new data comes along it can write it to the “free” block. I left a part out. The goals is that sometime when the SSD is not being heavily used, it will find time to erase the deleted data, leaving those blocks ready for the fastest possible write performance. Does anyone know if Trim Enabler is available for OS X Leopard 10.5.8 or Tiger 10.4.11? My research says no. Another approach is to buy either OWC or Crucial SSDs that have internal processors that take care of garbage removal. I would prefer to add Trim management to the OS, then I can use any SSD that I want. Is there any more info out there. Hey mike, have you found a solution for trim on 10.5.8? Still trying to figure out if to put a hdd or a ssd for that OS X. Hope you found something, cause I haven’t, seeking out various threads and websites.